At first I thought the wind had ripped the roof off the shed. 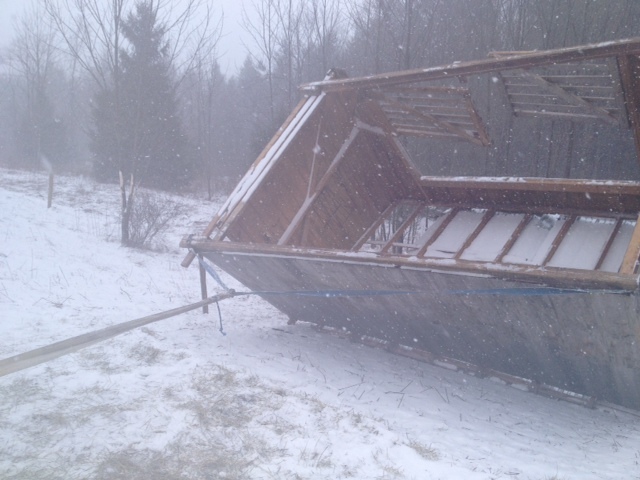 Then I realized that the shed had actually flipped over, twice, onto its roof. Amazingly, the goats were all okay. They must have been crowded on the other side of the pasture, waiting for me to come up with their grain ration. Notice, in the photo above, that they are chowing down as though their house is not upside-down right behind them. This shed is the older and larger of the two. We built it the year we got Violet and Pansy, and then Juniper and Sassafras, in the spring of 2010. It was like our second carpentry project. Since then we have dragged it all over the hill: three summers and at least three dozen moves. So we were not sure what it would look like if we were able to get it back round again. Farmer Fin bought a high lift jack at Agway, and our trusty friend Dan headed up to help out. While he waited, Fin jacked up the shed. Safety first! 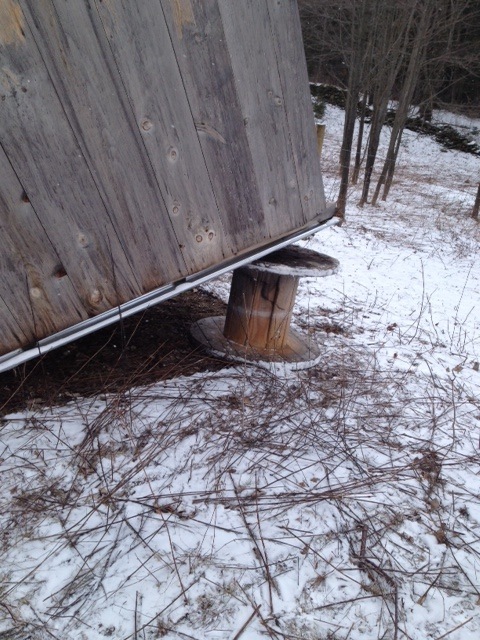 FF wedged the goats' wire spools underneath the raised section of the shed. He was later informed by our dear and knowledgeable degenerate mechanic friend that this form of ingenuity is known as the "Alabama Jack Stand." A blizzard arose as FF worked the come-along to get the shed onto its side. It was a pretty hairy ten minutes (or so I heard; I was actually at the day job). By the time Dan got here and I got home from work, Farmer Fin had successfully flipped it once. I tried to distract the goats while the menfolk used the truck and the come-along and various lengths of rope to flip it again. 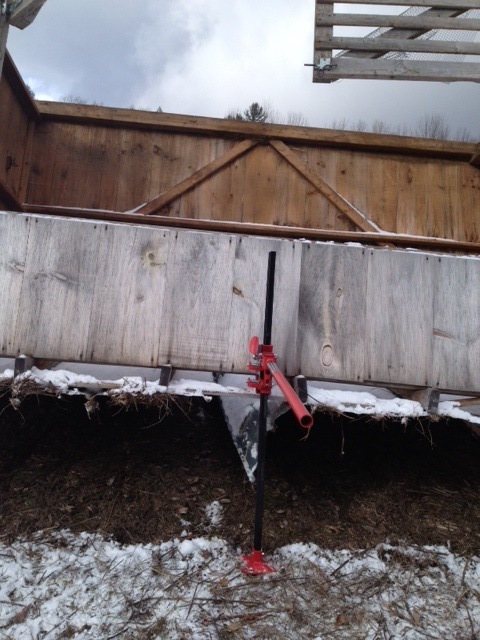 Amazingly, the structure survived with minimal damage - some cracked siding and one torn-off roof panel, now repaired. All told, it took about three hours of patient work to restore what a gust of wind upset in a few seconds. But all's well that ends well.